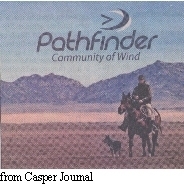 I am sending you the information I have gathered on wind power and the associated issues. 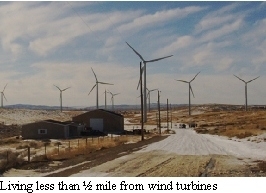 I am hoping Wyoming will stop or at least limit the damage done by the unregulated growth of wind power. There is an illusion that Americans have unlimited property rights and to abridge those is somehow wrong. Putting up 300 ft towers with spinning blades does not just affect the property owner-it affects everyone near the property. (See printout) The closer to the property, the more the effect. I cannot put a 300 ft tower on my property-there are county laws and covenants that don't allow this. I cannot open a hog feed lot if I want-again, prohibited. Prohibiting wind turbines is no different. Wyoming has zoning laws in many counties. One cannot build a Walmart warehouse on their back 20 acres if they live in a rural residential area. Wind turbines are not farms-we don't grow them. Treat them like any other industrial site..
Wyoming does not want to discourage industry. However, if a large group of ranchers banded together and built 400 foot towers to broadcast to outer space, would this be considered a really good idea? Would it be allowed? What if the federal government funded it? Is it justifiable to have thousands of towers all over the state to communicate with outer space? No, wind turbines are not communicating with outer space, but there is much disagreement over whether wind turbines have any function beyond large chunks of metal and concrete that destroy habitat and eat money. If my figures are right, between the 11 towers next to Casper and the turbines north of Casper in Converse county, the 11 towers are to produce 16.5 mw and the ones in Converse county, 99mw. The oldest unit at Dave Johnson power plants produces 114mw. So in the next 6 or 12 months, that turbine will shut down, right? I mean, if we can't shut down a dirty coal plant's turbine when we have the equivalent in wind power, what is the value? No excuses accepted-it's yes/no answer. Either we shut down part of a plant or the turbines are not as advertised and should be investigated for taking subsidies under false pretenses. And stop putting them up if they don't allow us to close power plants. The reality is I have not found reports of coal power plants being replaced by wind power, even in countries with many, many turbines. Canada is attempting to shut down it's coal fired power plants, but their replacements are nuclear, hydro, biomass, etc. Maybe there are a couple of genuine closings, but they are apparently not common. I believe that if wind power could do what it's advertised to do, Europe should be cutting way back on coal fired plants and be bragging about it. Yet I find nothing on how many coal fire plants have been replaced and several stories on new power plants (some natural gas, some nuclear) being built in China, Europe and Canada. The wind turbine industry has apparently dealt a death blow to the idea of biodiversity and the saving of old growth forest. 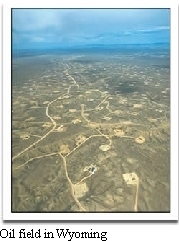 Interestingly enough, biodiversity was often screamed out as a reason to not drill for oil. We would damage the fragile ecosystem-the Rock Springs area and the Jack Morrow hills were singled out as someplace we needed to protect from oil and gas development. In Canada, wind turbines can be built where houses cannot. Trees are routinely cut for roads and turbines along ridge tops in the eastern US. Mining in the same area is vehemently opposed. Comparisons between oil and wind environmental impact can be difficult to illustrate. Skytruth, a website that monitors environmental damage from oil and gas curiously lacks photos of large wind turbine sites going in and what it looks like after installation. The above photos show an installed wind plant in California, an oil field in Western Wyoming, and two photos of installation of wind turbines. Turbines vs drill rigs? Looks a lot alike to me. Roads, towers, noise, pollution from maintenance vehicles, etc. Except the wind turbines are much taller and stand out against the environment more. While there are often quotes of the turbines lasting 20 years and not requiring much maintenance, the Medicine Bow wind turbines are actually deteriorating after only 5 years. Since it went on line, there have been 30 major outages. Turbines will go off warranty in 2011. In addition, the article I found this information in contains statements on utilities buying into wind projects in other states for Renewable Energy Credits. I have heard that the turbines near Hanna are owned by a California firm and will not be hooked up to transmission lines. The turbines just fill the utility's REC credits. If that is true, California is using our state for it's REC's so California doesn't have to have its landscapes disturbed. So what does that make Wyoming? A dumping ground? It appears we are an excellent place to exploit. The excise tax idea is a good one, but if the turbines by Hanna are "decorative" and not functional, I am thinking there would be no tax. That would make Wyoming a cheap dumping ground. A Minnesota wind firm complained in the Star Tribune that an excise tax would be too much of a burden for his firm. Actually, Minnesota is revamping it's tax on wind turbines and Wyoming is looking much cheaper to him than Minnesota. According to the Worthington Daily Globe, Minnesota is considering taxing the entire value of the turbine, not the output. Maybe Minnesota has the right idea. 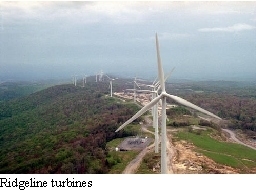 Tax the turbines like any other real estate in an industrial setting. Maybe the rancher should get taxed at industrial rates, too. It's no different than putting in a warehouse, a factory, etc. Taxes should be equally applied. Large quantities of concrete, aluminum, copper ,etc are required to build wind turbines. Environmentalists have opposed gravel pits and mining and still raise objections to these activities. There were protests against a copper mine in Utah. However, the gravel and other materials have to come from somewhere. So as more and more turbines are installed and maintenance ongoing, more and more gravel pits will be needed and mining, whether in a third world country where we can pretend it's not a problem or in our country. Chemicals are also necessary for production of blades, plus transportation of turbine parts to the turbine sites requires large vehicles and a great deal of fuel, with the associated carbon dioxide emissions. One common objection to oil development was that it made people rich. Yet there has been little objection to wind developers paying up to $15,000 per turbine lease to ranchers and farmers. A rancher that allows 30 wind turbines stands to make $450,000, which is a fair sum of money with no real investment or labor required. As one Texas rancher noted "the wind farm is total profit without any work." If someone leasing to Halliburton said that, there would be a mass outcry. Plus, there are a lot of subsidies to wind, so tax money pays the rancher to profit without work. I wonder how the millions of people out of work feel about their taxes paying someone six figures a year for doing nothing. In actuality, wind turbines can make near millionaires (or multimillionaires, if you use the Al Gore method of adding all years income together) out of anyone who owns enough acres in a windy area. Finally, environmentalists can be rich without work the same as they despised and damned the oil companies for. If wind energy is the way to go and developers are proud of what they do, why does Pathfinder-A Community of Wind show the historic Pathfinder Ranch as it is today, complete with a cowboy, horse and dog, instead of an artist's rendering of what the project will look like? It should not be necessary to lie (which is what this is-an attempt to deceive people concerning the actual outcome) if the turbines are so wonderful for the environment? Windmills may make people think they are doing all that is necessary to save the planet-and encourage them to buy cheap merchandise, fill landfills, and waste in other areas. There is already a tendency to think CO2 is the only thing that harms the environment. If you use CFL bulbs and drive a hybrid, you can waste all you want in other areas and avoid reducing electricity usage on a large scale. Species can be destroyed and open spaces and even forests can sacrificed for carbon dioxide emission reduction. Or for the money in carbon dioxide reduction, most likely. Real solutions get squeezed out and billions of dollars wasted on marginal solutions. Wind plants might be a source of income for Wyoming, but if we are going to give up open spaces and become just another industrial state and crowded urban landscape (as often seems to be the goal of many politicians and developers), let's go all the way and legalize gambling and prostitution. Forget wind-there's more money in vices and if we're going to destroy the land for money, let's get as much as we can.